I loved reading, as I call it, the poison pen letter! So angry was Moroni…Pahoran, such a good man, and how humble Moroni became when he understood. “During a perilous period of war, an exchange of letters occurred between Moroni, the captain of the Nephite armies, and Pahoran, the chief judge and governor of the land. Moroni, whose army was suffering because of inadequate support from the government, wrote to Pahoran ‘by the way of condemnation’ (Alma 60:2) and harshly accused him of thoughtlessness, slothfulness, and neglect. Pahoran might easily have resented Moroni and his message, but he chose not to take offense. Pahoran responded compassionately and described a rebellion against the government about which Moroni was not aware. And then he responded, ‘Behold, I say unto you, Moroni, that I do not joy in your great afflictions, yea, it grieves my soul. … And now, in your epistle you have censured me, but it mattereth not; I am not angry, but do rejoice in the greatness of your heart’ (Alma 61:2, 9) (Elder David A. Bednar, “And Nothing Shall Offend Them“, Ensign, Nov. 2006. Emphasis added.). WOW!!! If only we could have, “but it mattereth not,” attitudes in such situations. How many misunderstandings, grudges, conflicts, offenses, etc. could be avoided with a simple, “but it mattereth not“? I invite you to ponder some profound principles from Elder David A. Bednar on this matter of “but it mattereth not”. The weird thing about his message is that you will have to make sure that you are not be offended by it. He is very tactful, but also very direct. ENJOY!!! This afternoon I pray that the Holy Ghost will assist me and you as we review together important gospel principles. During the years I served as a stake president, I often would contact one of the bishops and invite him to prayerfully identify individuals or families we could visit together. Before traveling to a home, the bishop and I would kneel and petition our Heavenly Father for guidance and inspiration, for us and for the members with whom we would meet. In the grand division of all of God’s creations, there are things to act and things to be acted upon (see 2 Nephi 2:13–14). As sons and daughters of our Heavenly Father, we have been blessed with the gift of moral agency, the capacity for independent action and choice. Endowed with agency, you and I are agents, and we primarily are to act and not just be acted upon. To believe that someone or something can make us feel offended, angry, hurt, or bitter diminishes our moral agency and transforms us into objects to be acted upon. As agents, however, you and I have the power to act and to choose how we will respond to an offensive or hurtful situation. Thomas B. Marsh, the first President of the Quorum of the Twelve Apostles in this dispensation, elected to take offense over an issue as inconsequential as milk strippings (see Deseret News, Apr. 16, 1856, 44). Brigham Young, on the other hand, was severely and publicly rebuked by the Prophet Joseph Smith, but he chose not to take offense (see Truman G. Madsen, “Hugh B. Brown—Youthful Veteran,” New Era, Apr. 1976, 16). In many instances, choosing to be offended is a symptom of a much deeper and more serious spiritual malady. Thomas B. Marsh allowed himself to be acted upon, and the eventual results were apostasy and misery. Brigham Young was an agent who exercised his agency and acted in accordance with correct principles, and he became a mighty instrument in the hands of the Lord. The Savior is the greatest example of how we should respond to potentially offensive events or situations. “And the world, because of their iniquity, shall judge him to be a thing of naught; wherefore they scourge him, and he suffereth it; and they smite him, and he suffereth it. Yea, they spit upon him, and he suffereth it, because of his loving kindness and his long-suffering towards the children of men” (1 Nephi 19:9). Through the strengthening power of the Atonement of Jesus Christ, you and I can be blessed to avoid and triumph over offense. 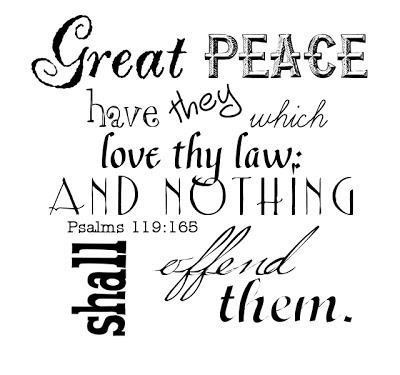 “Great peace have they which love thy law: and nothing shall offend them” (Psalm 119:165). The capacity to conquer offense may seem beyond our reach. This capability, however, is not reserved for or restricted to prominent leaders in the Church like Brigham Young. The very nature of the Redeemer’s Atonement and the purpose of the restored Church are intended to help us receive precisely this kind of spiritual strength. Elder Maxwell also insightfully explained that in this latter-day learning laboratory known as the restored Church, the members constitute the “clinical material” (see “Jesus, the Perfect Mentor,” Ensign, Feb. 2001, 13) that is essential for growth and development. A visiting teacher learns her duty as she serves and loves her Relief Society sisters. An inexperienced teacher learns valuable lessons as he teaches both supportive and inattentive learners and thereby becomes a more effective teacher. And a new bishop learns how to be a bishop through inspiration and by working with ward members who wholeheartedly sustain him, even while recognizing his human frailties. Understanding that the Church is a learning laboratory helps us to prepare for an inevitable reality. In some way and at some time, someone in this Church will do or say something that could be considered offensive. Such an event will surely happen to each and every one of us—and it certainly will occur more than once. Though people may not intend to injure or offend us, they nonetheless can be inconsiderate and tactless. You and I cannot control the intentions or behavior of other people. However, we do determine how we will act. Please remember that you and I are agents endowed with moral agency, and we can choose not to be offended. During a perilous period of war, an exchange of letters occurred between Moroni, the captain of the Nephite armies, and Pahoran, the chief judge and governor of the land. Moroni, whose army was suffering because of inadequate support from the government, wrote to Pahoran “by the way of condemnation” (Alma 60:2) and harshly accused him of thoughtlessness, slothfulness, and neglect. Pahoran might easily have resented Moroni and his message, but he chose not to take offense. Pahoran responded compassionately and described a rebellion against the government about which Moroni was not aware. And then he responded, “Behold, I say unto you, Moroni, that I do not joy in your great afflictions, yea, it grieves my soul. … And now, in your epistle you have censured me, but it mattereth not; I am not angry, but do rejoice in the greatness of your heart” (Alma 61:2, 9). I conclude my message with two invitations. I invite you to learn about and apply the Savior’s teachings about interactions and episodes that can be construed as offensive. “Be ye therefore perfect, even as your Father which is in heaven is perfect” (Matthew 5:43–44, 46–48). Interestingly, the admonition to “be ye therefore perfect” is immediately preceded by counsel about how we should act in response to wrongdoing and offense. Clearly, the rigorous requirements that lead to the perfecting of the Saints include assignments that test and challenge us. If a person says or does something that we consider offensive, our first obligation is to refuse to take offense and then communicate privately, honestly, and directly with that individual. Such an approach invites inspiration from the Holy Ghost and permits misperceptions to be clarified and true intent to be understood. Many of the individuals and families who most need to hear this message about choosing not to be offended are probably not participating with us in conference today. I suspect all of us are acquainted with members who are staying away from church because they have chosen to take offense—and who would be blessed by coming back. Will you please prayerfully identify a person with whom you will visit and extend the invitation to once again worship with us? Perhaps you could share a copy of this talk with her or him, or you may prefer to discuss the principles we have reviewed today. And please remember that such a request should be conveyed lovingly and in meekness—and not in a spirit of self-righteous superiority and pride. As we respond to this invitation with faith in the Savior, I testify and promise that doors will open, our mouths will be filled, the Holy Ghost will bear witness of eternal truth, and the fire of testimony will be rekindled. As His servant, I echo the words of the Master when He declared, “These things have I spoken unto you, that ye should not be offended” (John 16:1). I witness the reality and divinity of a living Savior and of His power to help us avoid and overcome offense. In the sacred name of Jesus Christ, amen. I invite you to ponder some profound preaching from Elder David A. Bednar on this matter of “but it mattereth not”. The weird thing about his message is that you will have to make sure that you are not be offended by it. He is very tactful, but also very direct. ENJOY!!! ON “ABOUT” THIS DAY IN 1829: Harmony, Pennsylvania. David Whitmer arrived, met Joseph Smith for the first time, and satisfied himself of the Prophet’s divine inspiration. Fayette, New York. Joseph Smith and Oliver Cowdery moved into the home of Peter Whitmer Sr., where Joseph resumed translation of the Book of Mormon.